NEW DELHI, India (CNN) -- Suspected Maoist rebels in eastern India who held up a train carrying 300 passengers Wednesday ended their siege after a four-hour standoff, officials said. 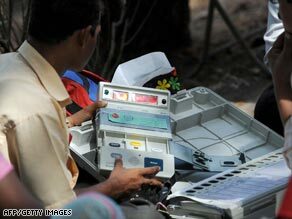 An election official in Maharashtra Wednesday. Maoist rebels seized the train as India continued to vote. No one was hurt, said A.K. Chandra of India's east-central railway. The suspected rebels seized the train, apparently to protest that some former comrades are taking part in general elections that are under way in the country. The Maoists didn't want the former rebels "to join the mainstream and, therefore, stopped this train," said Sarvendu Tathagat, deputy commission of the Latehar district in the state of Jharkhand. Jharkhand is a mineral-rich state where rebels -- known as the Naxalites -- claim to be fighting for the rights of the poor and the dispossessed who have not benefited from the state's resources. About 300 men, apparently unarmed, boarded the train, disabling its braking system as it passed through a dense forest. The hijackers released the train after "persuasion" by area villagers and railway officials, Chandra said. "They wanted your (media) presence," he said of the hijackers' possible motive. Jharkhand has seen stepped-up deadly attacks by rebels while the country is in the midst of month-long general elections. The second round of the elections begin Thursday. On April 16, when the voting began, suspected rebels triggered an explosion that forced a bus carrying border security troops to stop in the same Latehar district. When the troops stepped out, the attackers killed at least six in a three-hour gun battle. And in neighboring Bihar state, suspected Maoists, who had called for a general strike, set eight trucks on fire, shot dead a driver, and blew up a government office on Wednesday, police said. The Maoist insurgency has claimed more than 6,000 lives since the late 1960s. Indian Prime Minister Manmohan Singh has called the rebels India's biggest security threat. The elections, covering more than 3 million square kilometers of the planet, will run until next month in several stages of scattered polling. Then, elections officials will count the vote electronically in a single day -- on May 16, three days after the last round of polling. It is an exercise that India undertakes every five years for its 1 billion-plus population. This year, the country is voting in 543 boroughs of the Lok Sabha, or the lower house of the Indian parliament. In the elections this year, 714 million registered voters are eligible to cast ballots. The number is up 43 million from the last vote.